I've been spending my time at our local theater, but while I was away I did have the chance to read a book. A book about stage management ironically enough, so it was an easy theater tie in. I've been slowly learning how to do things at the theater and wanted to conquer stage management next. I had watched a few people stage manage before me so I knew the general direction of things. What needed the most attention, what didn't deserve stressing out and what I could improve on organization skill wise. I had mentioned my interest in being a stage manager and was told I'd be a good fit to try a small cast first. Small cast here meaning four people; however the production currently happening was the only one of the season with a small cast. And then I was handed a few books and PDF's to read by friends, Stage Management being one of them. I read the book in less than a week and took extensive notes. I found that a lot of the chapters went a little overboard for the type of theater that work at but it would be great for a traveling stage show or a show on a much larger scale. 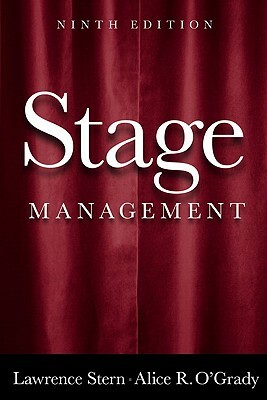 The book offers many examples of paperwork that you could use to aid you in your stage managing journey. As well as check off sheets for setting the stage, cleaning the stage and emergency protocols. I would suggest this book to anyone who has an interest in stage managing. I believe it's a school text book, but very handy to anyone looking to apply a more structured stage management environment. And apparently my note taking and book reading paid off. I was recently asked to stage manage our next production, 9 to 5 the musical. I know if it wasn't for this book my workstation and binder would be a pigsty and I would be completely lost. I'm going to make Dolly proud, Y'all!